Anti-TNF alpha therapy is a frequently used treatment in pediatric and adult inflammatory bowel disease. Unfortunately, some patients lose response to infliximab over time, referred to as loss-of-response (LOR). To combat LOR, The TAXIT and TAILOR-IX trials were designed to test proactive approaches of therapeutic concentration monitoring. Although these studies did not achieve their respective primary endpoints, defined as steroid free clinical remission, these strategies were nonetheless associated with lower drug costs. These and other trials were designed to optimize infliximab treatments in patients who were receiving maintenance therapy. 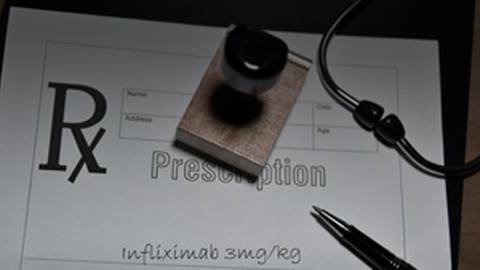 Very few data are available on infliximab levels during induction therapy and their impact on long-term response. The authors of this study performed a longitudinal cohort study of IBD patients at a single European center, examining outcomes of 269 patients treated with infliximab. Three outcomes were characterized and analyzed: the LOR-switched group included 28 patients requiring switch to another treatment because of loss of response. The LOR-optimized group included 60 patients who experienced loss of response but responded to infliximab optimization. The long-term responders group included 64 patients who were treated with infliximab without requiring optimization. A fourth group, the stop group, was also analyzed, composed of 58 patients who stopped treatment because of deep remission, defined by no symptoms, normal CRP level, and partial or complete mucosal healing at endoscopy. Samples were collected prospectively from 2007-2015 with a retrospective analysis of clinical data. During follow-up, patients were defined according to treatment outcome. Results of this study show that at week 6, median infliximab levels were lower in LOR-switched group, as compared to patients in the long-term respondersgroup and LOR-optimized group. At week 2, median infliximab levels were lower in the LOR switchedgroup as compared with the long-term responders, but was not significantly different for the LOR optimized group. In the LOR switched group, median infliximab levels at induction (weeks 2 and 6) were significantly lower when patients had been previously exposed to antitumor necrosis factor compared with naïve patients. Detection of antibodies to infliximab occurred in similar rates to other published studies. This study characterizes infliximab levels obtained during induction at 6 weeks as ‘trough’ levels, that is, between the 2nd and 3rd induction dose, which may not conform to standard view. Likewise, this study does not compare outcomes between 6-week and 14-week-intervaled infliximab levels (i.e. between the 3rd induction dose and 1st maintenance dose, as is common in other studies). Regardless of how the term ‘trough’ is used, this study suggests that patients who do not respond to any optimization strategy have lower infliximab levels during induction at week 6, suggesting that Infliximab levels measured early on in induction could predict treatment failures to infliximab during maintenance. This study also confirms that optimization helps decrease the presence of antibodies to infliximab. A detailed review of a study regarding the impact of the pharmacokinetics of IFX at induction on treatment failure. Infliximab Trough Levels at Induction to Predict Treatment Failure During Maintenance. Liefferinckx C1, Minsart C, Toubeau JF, Cremer A, Amininejad L, Quertinmont E, Devière J, Gils A, van Gossum A, Franchimont D.
Infliximab (IFX) is indicated for the treatment of inflammatory bowel diseases (IBD). Nevertheless, loss of response (LOR) to IFX is reported in up to 10% to 30% of patients within the first year of treatment. Our objective was to evaluate the impact of the pharmacokinetics of IFX at induction on treatment failure. This is a longitudinal cohort study on 269 patients with IBD treated with IFX in a single center. A total of 2331 blood samples were prospectively collected from 2007 until March 2015 with a retrospective analysis of clinical data. IFX trough levels (TLs) were measured by enzyme-linked immunosorbent assay. Antibodies to IFX were measured by drug-sensitive bridging assay. During follow-up, patients were defined according to treatment outcome. At week 6, median IFX TL in patients requiring a switch to another treatment due to LOR (LOR switched group) (2.32 μg/mL [0.12-19.93 μg/mL]) was lower than in patients with long-term response (long-term responders) (8.66 μg/mL [0.12-12.09 μg/mL], P = 0.007) and in patients responding to optimization (LOR optimized group) (7.28 μg/mL [0.17-14.91 μg/mL], P = 0.021). At week 2, median IFX TL was lower in the LOR switched group (5.7 μg/mL [0.15-12.09 μg/mL]) compared with the long-term responders (11.92 μg/mL [0.14-19.93 μg/mL], P = 0.041) but no significant difference was reached with the LOR optimized group (11.91 μg/mL [0.23-12.09 μg/mL], P = 0.065). In the LOR switched group, median IFX TL at induction (weeks 2 and 6) was significantly lower when patients had been previously exposed to anti-tumor necrosis factor compared with naive patients (0.91 μg/mL [0.12-4.4 μg/mL] versus 6.6 μg/mL [0.15-19.93 μg/mL], P = 0.044). This study suggests that patients who do not respond to any optimization strategy have lower IFX TLs during induction at week 6. IFX TLs measured early on at induction might predict treatment failure to IFX during maintenance.